Maple Sleigh is like a quieted-down Brooklyn on a Sunday winter morning. Think about that steaming mug of hot coffee along side a steaming stack of flapjacks and you’ve got this flavor down pat! Smooth, creamy, slightly sweet… now, that’s what I’m talkin’ about! 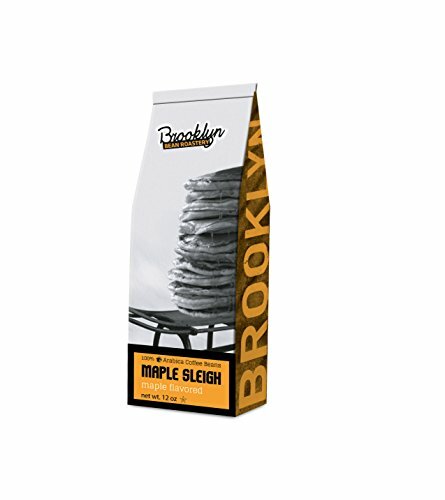 Brooklyn Bean Roastery Maple Sleigh – Maple Flavored Ground Coffee – Highest quality 100 percent Arabica beans. Maple Sleigh is like a quieted-down Brooklyn on a Sunday winter morning. Think about that steaming mug of hot coffee alongside a steaming stack of flapjacks and you’ve got this flavor down pat! Smooth, creamy, slightly sweet… now, that’s what I’m talking’ about! Carefully selected and expertly roasted beans provide a bold taste and great aroma. To start enjoying freshly brewed coffee, buy Brooklyn Beans coffees today. Brooklyn Bean coffee beans are roasted locally in small batches, to ensure high quality coffee and freshness you can taste. We chose small batch roasting over industrial roasting because it allows us to monitor and craft each batch to meet a higher standard of quality that is usually found in our coffee. 12 Ounce bag – Crafted with Pride in the USA.